WHAT HAPPENED: World No. 1 Novak Djokovic won his second US Open championship and his 10th career Grand Slam title with an electric four-set victory over 17-time major winner Roger Federer on Sunday evening. In a contest of the game's premier heavyweights, it was the Serb who played the biggest points the best, capturing his first crown in the Big Apple since 2011 with a 6-4, 5-7, 6-4, 6-4 triumph inside Arthur Ashe Stadium in a match whose start was delayed by approximately three hours because of rain. Djokovic jumped out to a one-set lead against the uncharacteristically sloppy Federer, who struggled to find his rhythm on serve. The 34-year-old clawed his way back into the match in a 62-minute second set that saw him convert one of nine break points while never facing one on his own serve. And while he was arguably the better player in the third, it was Djokovic who came through biggest in the key moments, winning both of his break-point chances and saving four of five on his own. Djokovic broke to begin the fourth set and again at 4-2, setting up a chance to serve for the match up two break. But Federer kept his hopes alive, closing a 5-2 lead to 5-4 and forcing the world No. 1 to again serve for the championship. And again, Federer rallied, earning double break point at 15-40 and another after Djokovic closed the game to deuce. Still, it was not to be for the Swiss. Djokovic forced a return long on his first championship point, staring and pointing into his player box before climbing up into the crowd to embrace his team and celebrate his third major title of the year, alongside victories in Melbourne and Roland Garros. It was the second time in his career that Djokovic had won three of the four Grand Slam tournaments in a single season; he also did so in 2011. "I wouldn't necessarily say I'm dominating, but I definitely am very proud of all of the achievements," Djokovic said. "You know, winning [a] Grand Slam is very special for any tennis player when you are dreaming of becoming a professional tennis player. When you are kind of finding that inspiration, motivation, these are the tournaments you dream of winning. "So to actually relive these moments again after 2011 it's quite incredible. To win against one of the biggest rivals, as you said, all-time Grand Slam champion, somebody that, you know, always keeps on fighting till the last point, keeps making you play an extra shot, yeah, all these things now are very special to me. The biggest tournaments that I have played this year, as anybody else, and I won three out of four. It's more than I could ask for, definitely. ... It's an ultimate challenge that I can have now winning against Roger back to back finals in Wimbledon and here, US Open. It's tremendous. I'm really, really proud of it." For the match, Federer converted just four of 23 break points, while Djokovic made good on six of his 13 opportunities. "I had too many break chances," said Federer, who was playing in his first US Open final since 2009. "Of course some of them I could have done better, should have done better, all these things. Surely, he didn't give me much, that's for sure, but still, I should have done better." In a battle of the game's best returner against one of the preeminent servers, it was Djokovic who set the tone early, forcing Federer to save three break points in holding a seven-minute first service game. Federer utilized the serve out wide effectively to open up the court, knowing it would be even harder to hit through Djokovic, who slipped and fell on his right arm and elbow in the fourth game of the match, in these cooler conditions and slower court. But broken twice in his first six matches at the Open, Federer was broken for the second time in three service games when the Serb threaded the needle with a backhand down the line at 30-40. Federer squandered a third break point of the set at 30-40, when he mishit a forehand long, and Djokovic did the same when he dumped a backhand into the net on his first set point on the Federer serve. But the 28-year-old held to love moments later to take a nervous 42-minute first set in which Federer never looked his best and in which Djokovic found a way to absorb the ground strokes of the No. 2 seed. Federer was the stronger player for much of the second set, earning nine break points to none for Djokovic, finally breaking through on break point No. 9 to take the frame on his fourth set point. And while Federer's sneak attack, known as the SABR, garnered the attention coming into the match, it was the way he blocked the kick serve back down the line from the backhand wing that did the real damage against one of the best returners in the history of the game. That was especially the case in the third set, when Federer earned a pair of break points at 3-4, but Djokovic again got out of trouble as he blasted through the wind that was behind Federer's back. Djokovic's incessant scrambling kept him in the set, no doubt, and he moved one set from victory after consecutive Federer forehand errors quickly undid all the hard work of the previous 50 minutes. Djokovic owned the fourth set early, then held on late. And at 5-4, he finally closed it out, capturing his second title in the Big Apple when his serve down the middle was returned long. "I knew he's going to be aggressive," Djokovic said. "He's going to try to disrupt my rhythm, and he's going to put a lot of variety in his game. slice, chip and charge, come to the net, serve and volley. Which he did. But I was ready for it. I was ready for the battle. That's what it was. Three hours, 20 minutes. We pushed each other to the limit, as we always do." WHAT IT MEANS: The victory gave Djokovic his third Slam of the year following wins in Australia and at Wimbledon and a loss in the final of Roland Garros. The 42nd meeting between the pair – they are now tied, 21-21 – and the 14th at a major – in which Djokovic leads, 8-6 – moved Djokovic into a tie with Bill Tilden with 10 Grand Slam titles, one behind Bjorn Borg and Rod Laver, who are tied for fifth most all-time. Djokovic is now the third man in the Open era to reach all four Slams in a calendar year, joining Rod Laver and Federer. Since the start of the 2011 season, Djokovic has won more titles (27) on hard courts than he's lost matches (25), and his win in Flushing Meadows gives him his seventh title of 2015. 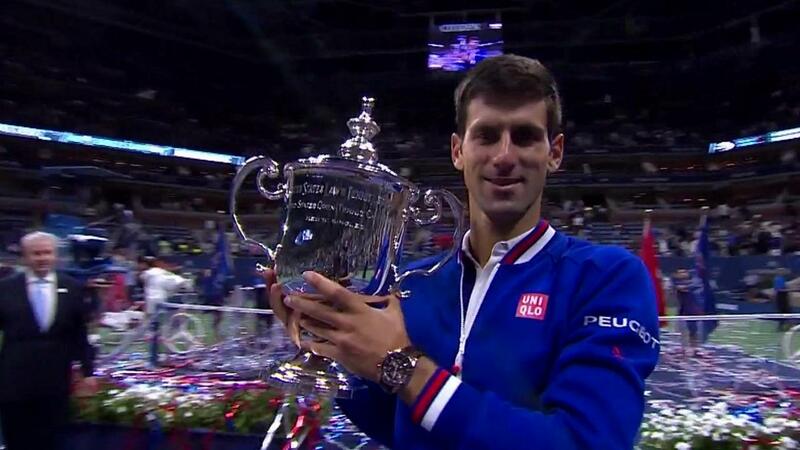 Djokovic has proved time and time again this year that he can outlast the best players on the planet. He showed once more how stubborn he is to break down from the back of the court, and he acted like a wall to absorb the best that the No. 2 player in the world had to offer. THE QUESTION: Federer reached the final at Wimbledon and the US Open, the first time he's made two Slam finals in the same year since 2009, but he failed to lift a trophy for the 14th consecutive major. With Djokovic showing he's by far the best men's player in the game, and with Stan Wawrinka and Andy Murray capable of competing for titles at every event, has time ran out for Federer to win No. 18?